Today was a beautiful day–hot but not too hot, a nice breeze and a great day to spend outdoors. 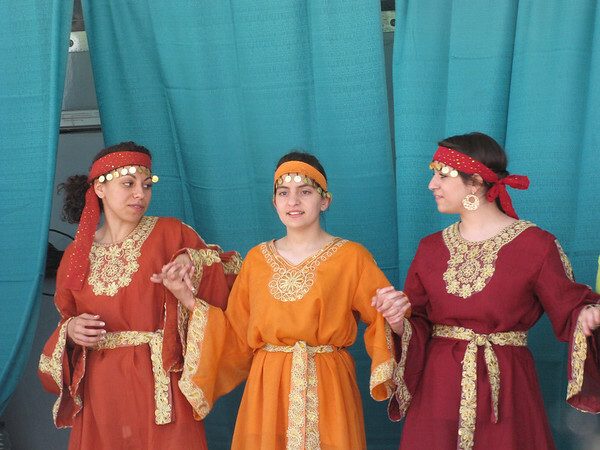 The Greek Festival has become an annual event hosted by St. Michael’s Orthodox Church. Wall to wall people crowded the food aisles, the bazaar while in the basement a traditional dinner of stuffed cabbage leaves, kibbeh, and pita was served along with some traditional sweets. Outside there was a band on the stage and at the last minute, the stage was cleared for the dancers as there just was not enough room for them in front of the stage. Before the dancers took the stage, an older lady with white hair was teaching a younger woman the traditional steps—although it looks like they younger one was helping her cross in front of the stage. Regretfully I forgot about the movie function on my camera but did manage to catch one of the numbers by the dance troupe. Scattered through the crowd were blue shirted church members with name tags that said–I speak English!